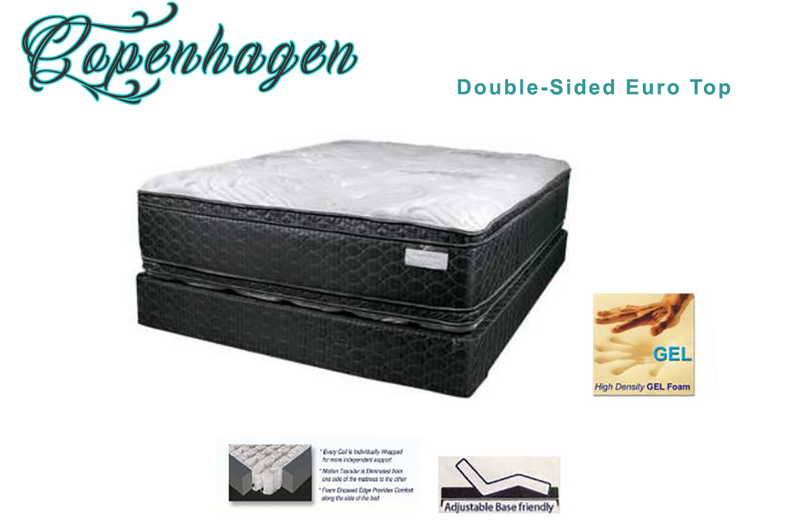 The "Copenhagen Double-Sided Euro Top" is an American-made, high-quality, premium mattress that is flippable. Careful consideration has been paid to its layer buildup and its overall construction. This is a mattress with a softer plush feel and that offers many luxury features for a relatively low price. Available in both standard and custom sizes, the Copenhagen offers cooling gel-infused foam, 14 gauge zoned high profile pocketed coils (high coil count), SUPER SOFT foam layers, a double insulator pad and a double-sided design. Its zoned coils provide more support where it's needed most and its gel-infused foam layers help to dissipate body heat. There are also handles on this model, helping to make it easier to flip. 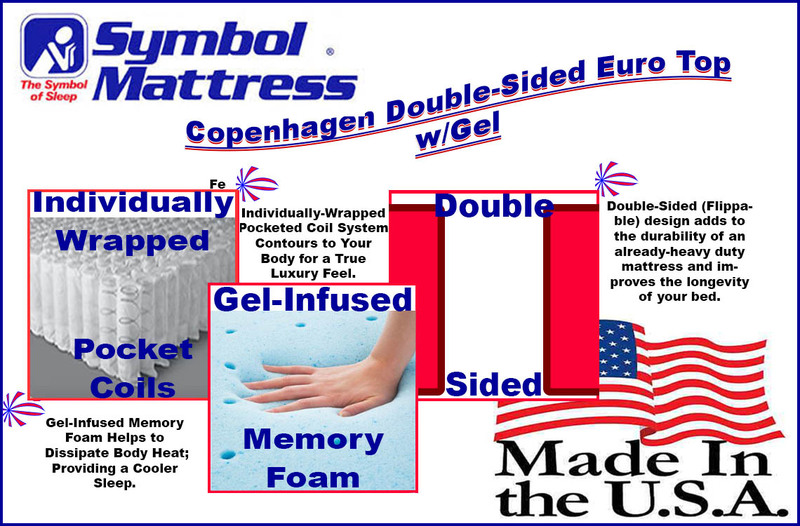 Made with CertiPUR-US materials in the United States, this is another value-and-quality based Symbol Mattress model that we're delighted to offer customers everywhere. If it's soft (though, supportive) that you're looking for, and you'd like to have the added durability of a double-sided design; the Copenhagen is for you! For a lofty, soft feel and a truly luxury build-up of layers, the "Symbol Copenhagen Euro Top" (Double-Sided) is definitely a great selection. High Profile individually-wrapped tri-zone pocketed coils - with a high coil count - offer both strong support and body-contouring comfort. The zoning of them - harder and softer in the appropriate areas - is a nice, premium mattress touch. Gel-infused foam layers (one on each side) help to reduce body heat transfer and aid in providing you with a cooler night's sleep. A strong foam encased edge means that you'll feel less bounce and motion transfer when your partner gets in and out of the bed. The insulator pads (one per side) keeps the foam from dipping into the springs, over time.